Most people assume that culture shock is something you experience when you come from one cultural environment into a totally different one. Mostly this is happening when visitors from first world developed nations visit a developing nation or a third world country where everything is more chaotic, unorganized and unpredictable. I have been living in Thailand for many years, and nothing seems unusual or strange to me. Thailand is a developing nation, but is surrounded on three sides by third world countries, namely Myanmar (formerly Burma), Laos and Cambodia. In the USA, a lot of the labor force comes from the poorer countries of Central and South America. They do the jobs that Americans don’t like to do, like agricultural, construction and cleaning work. Thailand is in a similar position. Many of the jobs that are shunned by Thais are done by workers from the surrounding third world countries. Thailand’s relative prosperity attracts tens of thousands of foreign workers who are able to earn much more here than in their poorer home countries. Thailand is quite an organized place. There is no third world chaos, it is clean, safer than most countries I have ever seen, easy to get around in and easy to live in as well. People line up patiently, there is no pushing and shoving like in India, there is no need for constant hard bargaining for every little thing like in Vietnam, and you can find most any amenities that you would want or need easily. Recently I had to get a new visa for Thailand, and decided to go to the Philippines to obtain it. So off I went to the capital Manila, a three hour flight from Bangkok. According to my guide book, all the budget accommodation is located in two districts, Malate and Ermita. This is also supposed to be the part of town where you can experience the “real” Philippines. I checked into a small hotel and ventured out into the neighborhood. To my surprise I found out quickly that I was right smack in the middle of the red light district with the ladies of the night chasing me down even long before nightfall. About every 10 meters someone tried very hard to sell me viagra or cialis, and pretty much everyone I talked to told me to be very careful since crime in Manila is rampant. Robberies and theft are constant threats. The most important job in Manila must be that of security guard since they are literally everywhere, armed with an array of guns from pistols to military style assault rifles. My hotel had an armed guard, the restaurant where I ate had an armed guard, and the 7/11 store where I bought my water had an armed guard as well. The parking attendant of the nearby mall had a military-style rifle slung across his shoulders. I spoke to the waiter of a restaurant and he told me that every single member of his family had been held up and robbed at least once. Needless to say, it was not a very relaxing environment. I have to admit that I was probably in the most extreme city in the Philippines, and within that city I was in a pretty bad area. 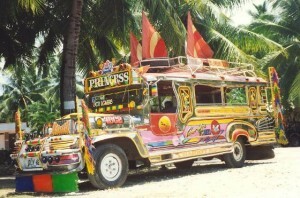 Certainly there are many parts of the Philippines which are much more pleasant, but I did not have time to visit them. There were probably quite a few tourists who enjoyed the wild nightlife, the free flowing alcohol, and the easy availability of the ladies of the night. But in my case, as a lifelong vegetarian, non smoker, non drinker, healing arts therapist and faithful monogamist, I felt totally and utterly out of place. But there is a silver lining to the story. When I returned to Thailand, I gained a whole new appreciation for my chosen home country. I had booked a room in advance. 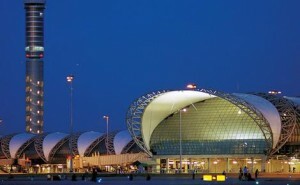 When I arrived at Bangkok’s super modern airport at 2 am I was picked up by a pretty and smiling young woman in a smart uniform. She whisked me to a big limousine with leather seats which took me to my airport hotel free of charge. In Manila I had paid US $25.- for a tiny, windowless room that needed a paint job badly, had no WiFi and only an ancient small TV. In Bangkok the same $25.- bought me a large room with a king sized bed, flat screen TV, free in-room WiFi, refrigerator and mini bar, and everything spotlessly clean. In the morning the limousine transferred me to the airport for my flight to Chiang Mai. I felt relieved to be home again in a country where you can walk around in the middle of the night almost anywhere and feel perfectly safe, where people flash you friendly smiles all day long, and where you get really excellent value for your money. Leaving Thailand for a while helped me appreciate again what I and tens of thousand of other expats have found here: A safe, pleasant, friendly place where your money goes a long way and where daily life is an enjoyable experience. Sometimes you just have to leave home to find out what you really like about it. And in this case my Philippine adventure provided the necessary contrast. So my Manila experience was a success after all. How did I end up moving to Thailand? 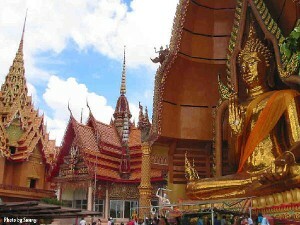 Nice article Shama, oh how I miss Thailand!